Tony Ave picked up the 1st last-place finish of his career in Monday’s Heluva Good! Sour Cream Dips at the Glen at Watkins Glen International when his #37 Long John Silver’s Dodge fell out with transmission problems after completing 8 of the race’s 90 laps. 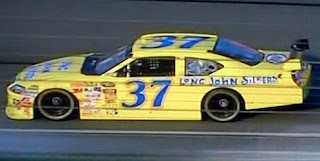 One of the so-called “road ringers,” Ave had only made one previous Sprint Cup Series start, also at Watkins Glen, where he finished 31st in 2004 driving for Stan Hover. In Friday’s qualifying session, Ave squeezed his way into the show in thrilling fashion. Throughout his timed lap, Ave flirted with Joe Nemechek’s speed of 119.770 mph, running parts of the course both faster and slower than Nemechek. Off the final corner, Ave’s car was not quite fast enough, but a burst of straightaway speed allowed him to beat Nemechek’s time by one hundredth of a second at a speed of 119.787 mph. Nemechek, who lost valuable practice time after an engine failure, joined Brian Simo and David Gilliland as the three drivers to miss the show. Ave started 43rd. However, transmission problems in Monday’s race forced Ave behind the wall, beating 2009 leader Dave Blaney by three laps. It was the second last-place finish for Front Row Motorsports’ #37 in 2009, the other coming with Tony Raines in June’s Lifelock 400 at Michigan. Ave is the first driver to finish last because of transmission failures this season, the sixth to have started last, and, along with David Gilliland and Joey Logano, is now the third driver to finish last for the first time in 2009. Neither Front Row Motorsports nor the #37 had ever finished last at Watkins Glen.